Extra! Extra! 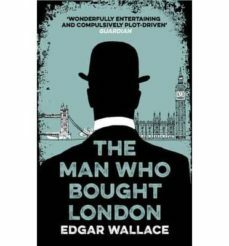 American billionaire King Kerry is using his immense wealth to, quite literally, buy London in this gripping mystery from prolific writer and creator of King Kong, Edgar Wallace. King Kerry and his associates own a huge and growing portfolio of properties and he has come to London to expand his empire. A charming and ambitious man, he nevertheless has made a few enemies along the way including the obnoxious and dangerous Hermann Zeberlieff whose bad business decisions and gambling habit mean he would like nothing more than to get his hands on Kerry's fortune.When Elsie Marion, late for work again and in a dreadful rush, bumps into a charming grey-haired man on the tube, little does she know how much her life is about to change. For the dashing stranger has just bought Tack and Brighten, her place of employment, and is about to offer Elsie a new job she simply cannot refuse.Thus begins a whirlwind of mysterious events for Elsie, as she soon finds herself in the cut-throat world of business in a London which she never knew existed before. King Kerry's rivals will go to deadly lengths to topple his growing property empire, and when a long-buried dark romantic secret from King Kerry's past comes to light, a shock will lie in store for all.